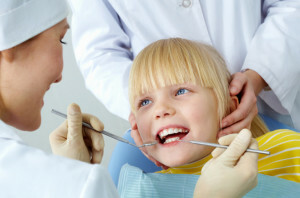 As a parent, teaching your child how to take care of their teeth is likely one of your goals. Taking your child to the dentist is one of the ways you can help your child understand the importance of proper dental hygiene. If you’re not sure when to make your first appointment with us for kids dentistry services, here’s what you need to know. You should take your child into our office for a kids dentistry appointment shortly after they celebrate their first birthday, or when you notice that a few teeth have popped through their gums. Although these teeth will eventually fall out, it is important to ensure that their teeth and gums stay healthy while they are saving the spots for permanent teeth. Your child’s first visit with our dentist, Dr. Anna Szmitko, will focus on introducing your child to the dentist and getting them used to the idea of getting their teeth looked at. During this appointment, we will likely talk to your child about developing good dental hygiene habits and perform a general cleaning. From there, we will provide you more information about how often to bring in your child for kids dentistry services as more of their teeth start to come in. When your child is between the ages of four and six, we will likely take their first set of X-rays to make sure that there aren’t any cavities in their mouth. Until they are about 12, preventing cavities from developing and helping your child establish flossing and brushing habits will be our primary focus.